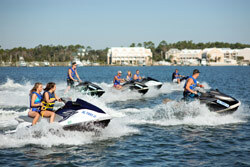 There is always something to suit your fancy in Gulf Shores & Orange Beach, Alabama. The two towns we call home have developed over time into multi-faceted vacation destinations, perfect for the outdoors enthusiast, the fisherman, the shopper or spa fan, the history buff, the foodie, the snowbird, and the sunbather. Explore our left sidebar to read articles on Things to Do on the Gulf Coast, and check back frequently for more inspiring vacation ideas! 12 Things You Didn't Know About The Gulf Coast and 10 Things To Love About Gulf Shores run down some of our all time unusual and all time favorite things to do. Read our Things To Do With Kids suggestions on places that are great for kids, particular younger kids too small to go-kart or enjoy some of our more vigorous amusement park activities. If you love nature, our Gulf Coast Wildlife article will point you in the right direction for some of the Gulf's most beautiful outdoor sights. Gulf Shores Seafood gives you a snapshot of the delicious fruits of the coast. Whether you're a foodie or a fishermen you'll want to find these items on your menu. Our Daytrips from the Gulf article points you to some fascinating historical destinations just miles from our Gulf Shores condos. With winter coming up, why not take a look at our Winter Activities? There's plenty to do all year long at Gulf Shores & Orange Beach. Read the Beachin' Bob Blog for one man's up close look at what's going on in Gulf Shores and day to day life, and check Maps & Directions to find your lodging and view the area.